Tackling the culinary and grammatical arts in simultaneous mouthfuls. When it comes to the music I listen to, if a song catches my ear I’ll (borderline) obsessively listen to it again and again. I do this until I feel like I’ve understood and consumed everything there is to be understood and consumed about it, often ignoring other music in favour of it. I’ve been like this since, well, forever, from when I listened to Bohemian Rhapsody every day for all of 1993 or more recently with my aural dependence on tUne-yArDs. It turns out I’m pretty much the same when it comes to ingredients. My culinary gaze has recently been drawn to the humble anchovy. More specifically, to its power when used as the underlying flavour of a good pasta sauce. Since the puttanesca a few weeks back, and the ah-mazing roasted tomato dish last week, I’ve found myself day-dreaming about these little flavour-filled fishies. As this new ingredient addiction took hold, I found myself looking up anchovy based ingredients on-line. I stumbled upon this really stunning looking recipe by Giorgio Locatelli and thought I could adapt it a wee bit to make the anchovies the main attraction. 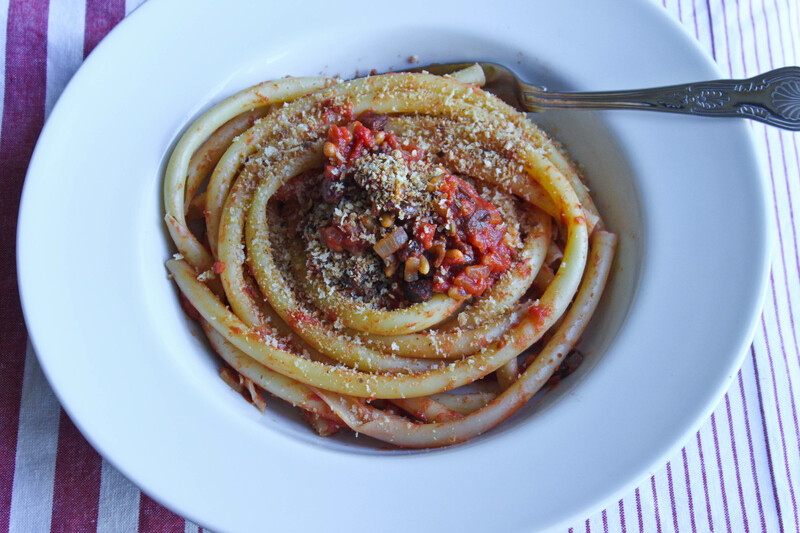 It took a little more effort than I’d usually put into my pasta on a Tuesday, but the resulting dish’s pungently rich and Moorish sauce made it a super early-week treat. The combination of saffron, raisins (or sultanas), fennel and, of course, anchovies make it a little on the out-there side for the more delicate tastebuds. But it’s perfect for those of you who love to indulge in the more exotic spices of the store-cupboard. This recipe is very much influenced by the Sicilian Pasta Con Le Sarde, which highlights the sardines as a culinary wonder. What I’ve done below is focused more on the anchovies, but kept the flavour makers of the raisins and fennel to the dish, and added the saffron from Locatelli’s recipe to keep things interesting. 200g (or enough for 2 to 3 people) of long pasta, such as spaghetti, linguine or even the thicker bucatini. In the picture, I’ve used Ziti pasta which was hilariously hard to eat, as it was so giant. I read the packet after dinner and saw that you’re supposed to break it into small pieces before cooking! Ah well, we eat and learn. The very first thing you have to do for this recipe is to soak the fennel seeds in water for one to two hours. You only need a drop of water, just enough to cover them. This will help soften them so they’re more pleasant to eat. It’s not a necessary stage to the recipe, and you can easily skip it if you like. Start cooking by heating one tablespoon of olive oil in a large frying pan over a medium to high heat. Meanwhile, chop up your onion. Now fry it in the large frying pan for 3 minutes, stirring often, until it’s starting to soften but hasn’t coloured much. Chop the anchovy fillets into small chunks, and once the onion has had its 3 minutes, add the chopped anchovy to the pan. Cook them for a further 1 to 2 minutes, stirring constantly, to help break up the anchovies and helping to coat the onions evenly. When the anchovies have kind of melted, you can add the 50ml of white wine. Let it bubble until it has completely evaporated. This will take around 3 to 5 minutes. Meanwhile, put a smaller frying pan on a medium heat. Without adding oil, toast the pinenuts in the dry pan until golden brown, shaking from time to time. This will take about 3 minutes. When the wine has evaporated and the pinenuts have toasted, add the pinenuts to the large frying pan. Take the small pan off the heat and set aside. Add the raisins/sultanas, pinch of saffron and fennel seeds (with their soaking water) into the large frying pan. Finally add the tin of chopped tomatoes and stir well. Season with salt and pepper and simmer on a medium to low heat for 15 minutes, until the sauce has thickened. After about 5 minutes when the sauce is starting to thicken, put a saucepan of boiling water on a high heat to cook your pasta. Cook it according to the packet’s instructions. Usually spaghetti-type pasta takes between 7 and 9 minutes. 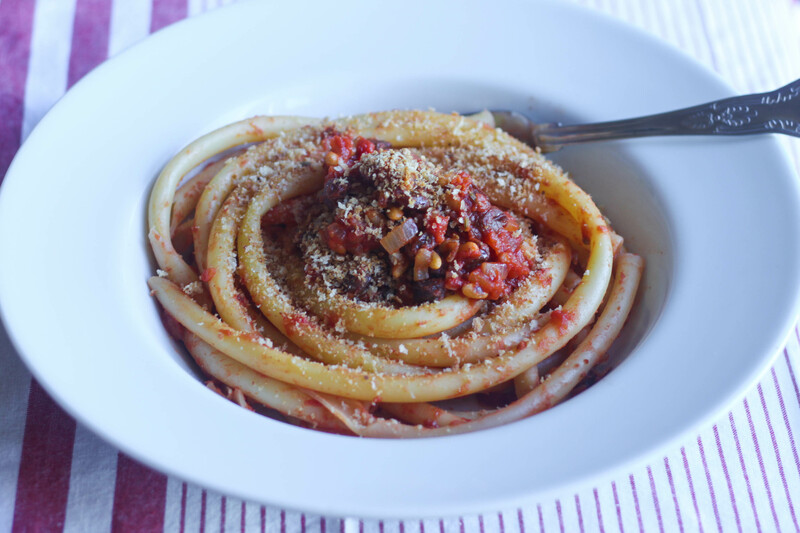 When the pasta is nearly ready and the sauce has thickened up nicely, you can toast your breadcrumbs. Using the same small frying pan you used for the pinenuts, dry toast the breadcrumbs over a medium heat until golden brown. This will take around 3 minutes. Be sure to shake it a lot so that you’re breadcrumbs don’t burn! That would be a real bummer. Once cooked, drain the pasta and return to its saucepan off the heat. Now add the sauce from the frying pan to the pasta and mix everything until the pasta is evenly coated with the sauce. Serve with a generous sprinkling of breadcrumbs, bringing the leftover breadcrumbs to the table to act as a crunchy alternative to Parmesan. This video goes some way to explaining my tUnE-yArDs obsession. Coulis-WOW. Love the perfectly swirled pasta! I’m an anchovy fan too. I came to love them late in life but I don’t understand when people say they hate them. They’re pure umami, what’s not to love? As an umami fiend, I concur. They’re amazing little guys. I do understand how people can be put off them after having them on pizzas, as they can be really over-whelming. In my opinion, they’re so much better cooked down in a sauce! I think they make the perfect secret ingredient in a sauce – they practically dissolve and supposed anchovy-haters would never know they’re in there, they would just think the sauce is delicious. Mwah ha ha! I love anchovies too. I was getting a little worried for a while there as they were featuring in almost every meal I cooked. I’ve managed to wean myself off them lately although I think I’m going to try your roasted tomato pasta dish tonight. Bring on the anchovies! Btw, what pasta are you using in this picture? It looks yum! Hope the roasted tomato dish went well for you! It’s definitely a keeper in my book. Funnily enough, that pasta is called Ziti and it’s a giant tubular pasta. It was hilariously tricky to eat so I checked on the packet after dinner if it was supposed to be broken up into small pieces before cooking. And it was! I get my pasta in Little Italy in Smithfield and they have loads of interesting shapes and sizes. 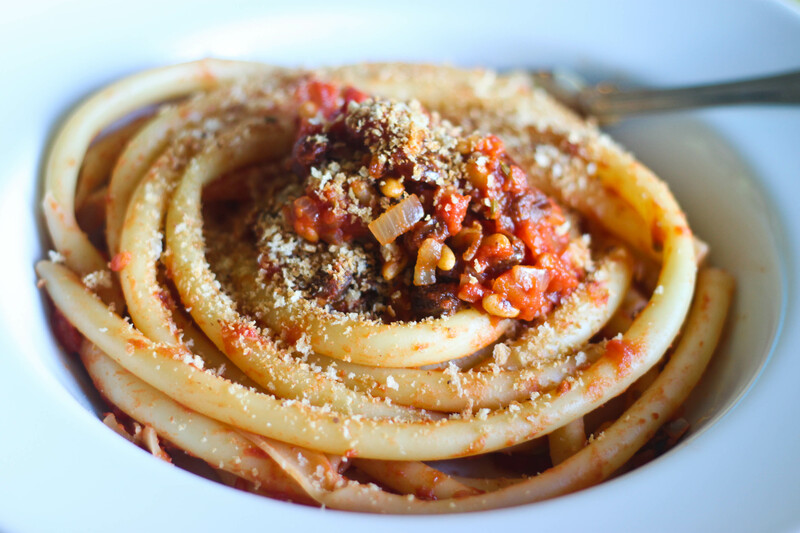 Bucatini is a thick spaghetti which is also fun, if a little tricky, to eat! Hi Dee! So glad you enjoyed the puttanesca. That roast lamb sounds AHMAZING. Definitely looking it up! and one harrowing cup worth of fruit later . I’m still laghuing at this and at least half a dozen other lines here. Tuna and veal has always sounded like the most unlikely combination but after looking at these pictures I’m almost convinced that it really is a good thing. individually imagine it from numerous numerous angles. Its like men and women are not interested except it’s one thing to do with Woman gaga! Your own stuffs great. All the time handle itt up! © 2008-2019 All rights reserved.